“Everyone involved in PHRA does an amazing job connecting with student members. It’s obvious they really care about helping us develop our future careers. Through events like this, I’ve developed a strong network and established many professional relationships." 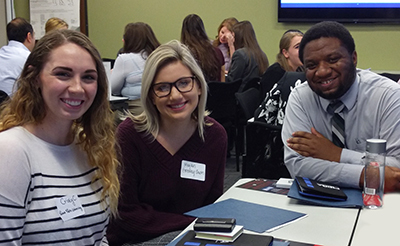 More than 1,300 HR professionals belong to the Pittsburgh Human Resources Association and Point Park University HR management students had the opportunity to network with many of them. At the Stations to Success Student Networking Event held at PHRA's headquarters — just steps from campus at One Gateway Center — Point Park HR majors prepared their elevator speeches while learning social media etiquette and top tips for networking. “Everyone involved in PHRA does an amazing job connecting with student members. It’s obvious they really care about helping us develop our future careers. Through events like this, I’ve developed a strong network and established many professional relationships,” said Kristen Blazeyewski, senior HR management major from Brentwood High School in Pittsburgh. Sandra Mervosh, M.S., SHRM-SCP, SPHR, assistant professor and coordinator of Point Park’s human resource management program, frequently connects students to various HR professional networking events throughout Pittsburgh. “My favorite part of the event was learning what PHRA has to offer such as their job shadow program. Currently, I’m job shadowing with the HR manager at U.S. Steel Corporation,” said Samantha Weber, a sophomore HR major from Seneca Valley High School in Harmony, Pa.